This article begins with a short update on the brake overhaul I discussed in the December 2009 issue. My TC brakes have begun to bed in nicely. At first I must say that with new shoes and ALFIN drums I expected more, much more. But now, after several miles the new parts are working fine and the car has better brakes than ever before during my stewardship. I hope it lasts, and I’ll be pulling the rear drums off soon to double check. I don't think the ALFINs provide a greater degree of stopping power with normal use over the original pressed steel drums, but under heavy breaking and spirited driving I think they will come into their own very quickly and make a positive impression with their added cooling capacity. And Man! They sure look nice with their purposeful looking rib design. The other topic I want to discuss is the front spindle or stub axle replacement. This can be a rather big deal and all TC owners should be aware of the potential for danger of this original part. Face it, your old TC, or TA or TB for that matter, is 60-some years old, and you don't know what it's been through in its previous life before it started living the good life with you. Having the spindles magnafluxed periodically and tended to if necessary, or even going so far as to have them updated as I have done, is a good safe idea. Check with our Canadian friend Bob Grunau (grunau.garage@sympatico.ca) to see if he will take your old steering knuckle stub axle, accurately cut off and bore out the old axle, and insert a new machined axle through the kingpin side. 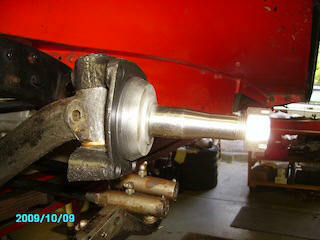 This new axle will be similar to the increased size of those on the TD/TF/MGA and will require new axle nuts. (See page #103 in TCs Forever for an excellent drawing). This is an opportune time to fit kingpins and bushings as well. The temperatures required to heat the spindle to 650° F in order to accept the frozen axle (-385° F) are quite extreme and would be detrimental to the bushings. Bob Granau performed this work to the stub axles of TC 5030 and although I always felt its steering was quite good (for a TC) it's even better now and safer as well, which can be attributed to the new bushings and stub axles. There’s quite a bit written about TCs and their steering parts on the internet and in great books like the aforementioned TCs Forever. Check out mg-tabc.org/techn-up.tcspindles.htm for an excellent article written by Peter Pleitner. Peter built a fixture to facilitate the repair of his spindles. It's quite a read and not a job for the faint of heart, and none of this is for the inexperienced. Makes Bob G.'s machine work a bargain. Before you tackle this sort of job, make sure you search as I did to find out all about the services and parts available. TCs, and all old cars really, have a few problems like this that need attention. It's good to know what they are and that folks out there are continuing to develop repair techniques to keep them safely on the road.